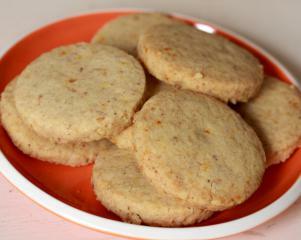 The combination of roasted walnut flavour with orange makes these cookies amazingly delicious. Combine all the ingredients in a food processor and pulse until the mixture becomes a dough. Form the dough into small balls (about 2 teaspoons of mixture) and place on a tray about 2 inches apart. Flatten the balls of dough a little and then bake in the oven for 20 minutes.